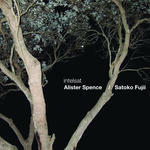 intelsat / Alister Spence, Satoko Fujii. 7 Sep 17: itelsat jazz club, Kiracho, Nishio, Japan. Featuring Alister Spence.